Not everyone wants chocolate for Valentine’s Day, or cupcakes with red and white sprinkles. Here are some delicious food ideas for the health enthusiast, the calorie counter, and anyone staying away from the sweets. Olive oil for Valentine’s Day? While this is a delicious EVOO for salad lovers, we first thought of this as a gift for health enthusiasts. The government recommends two tablespoons of olive oil a day as part of a heart-healthy diet—a practice that should start long before we’re at the age to worry about heart health! They can take the form of salad dressing; but we actually like to drink ours. The Koroneiki olives in Kiklos olive oil are grown in the Peloponnese peninsula of Greece. The varietal is known for levels of fruitiness, bitterness, and pepperiness. 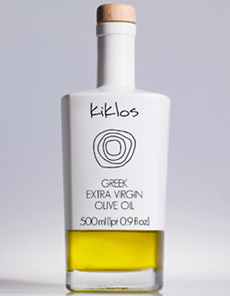 We found our bottle of Kiklos Greece to have buttery flavor with a bit of peppery kick (i.e., not earthy, green, grassy, or other olive oil flavors that some people might not to drink from the spoon. Everyone will like it. Plus, the handsome bottle (photo #1) even looks healthy! For your Valentine, add a red ribbon or a few peel-and-stick hearts. Buy it on the company website for $29; the bottle is 500 ml/16.9 ounces. Check out this olive oil wheel for an overview of all the flavors and aromas of olive oil. At upwards of of $10 per bottle, even the most avid pickle enthusiasts don’t eat artisan pickles as often as they like. Look to your local farmers markets, or to online specialists like Rick’s Picks. 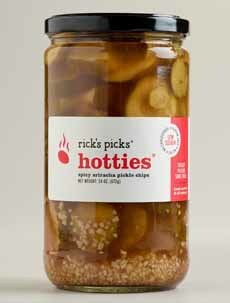 Rick’s Picks has a variety of gift boxes, but for a small Valentine gift, how about a bottle of Hotties spicy pickle chips (photo #2) for your own special hottie? Crunchy, spicy, tangy and low in calories: Help make Hotties a go-to Valentine gift. 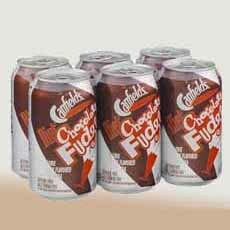 Canfield’s Diet Chocolate Fudge Soda has long been a staple food for calorie-counting chocolate lovers. We especially like to add it to nonfat milk for a diet egg cream, or add a small scoop of ice cream for a float. It’s sold nationwide; but if you can’t find it locally, you can buy a six-pack of Canfield’s Diet Chocolate Fudge Soda on Amazon (photo #3). Tie a bow on it. For those who don’t like artificial sweeteners, look for chocolate-flavored seltzers. In our neck of the woods, we can find White Chocolate Seltzer from Adirondack Beverages. We buy it by the case. There’s no better place to dine than a Japanese restaurant: no bread basket or dessert temptations. There are different types of salads, the soups are low in calories, you can often get brown rice, and green tea goes better with the food than cocktails. 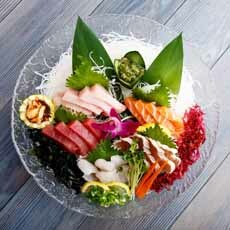 A deluxe sashimi plate is the best way to load protein with fewer calories (photo #4). Be sure to eat the yummy seaweed. Radish lovers: Enjoy that shredded daikon! If you aren’t taking the giftee to dinner yourself, put the restaurant gift certificate (or any gift card) in a Valentine card. 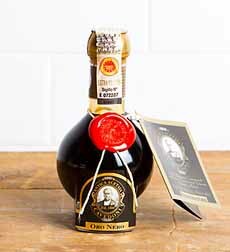 For us, nothing says I love you better than a pricey bottle of super-aged authentic balsamic vinegar (photo #5). A true gourmet looks forward to these precious drops, so dense they stand up by themselves, which are meted out with an medicine dropper. This is not the vinegar with which to dress salads; it’s an exquisite accent to anything from filet mignon to the finest Parmigiano-Reggiano cheese. Once you have your first taste, you may simply decide to drink droplets from the spoon! These precious liquids are sold in 100 ml/3.4-ounce bottles. A 25-year-old balsamic is in the $140-$180 range. A 50 year-old is double that. A 75 year-old is easily double that. Someone has not only been paying the expense to store it under proper conditions, but has not earned a penny from it in 25-50-75 years. If you see bargain prices, no matter what the label says (“authentic balsamic from Modena, Italy”), with a a red wax seal and/or a fancy box, pass it by. Given the normal prices of super-aged balsamic, there’s a lot of counterfeiting around. Or if not counterfeit, it may contain a drop of 50 year old balsamic mixed in with, say, 12-year-old balsamic. The bottom line: Buy from a reputable, knowledgeable retailer. Authentic bottles are of the shape shown in photo #4, are numbered, and have the Consorzio seal. Here’s more about balsamic vinegar. TOMORROW: A MOST LUXURIOUS VALENTINE GIFT. And…it’s still a better-for-you gourmet gift.